This article defines and explains the problem of getting the same data repeated throughout a label when using alpha characters are to define ^FN (field numbers) in ZPL language. We discovered an anomaly with this command. Instead of using a number for the #, a client used alpha characters (i.e. ^FNSeq instead of ^FN1). 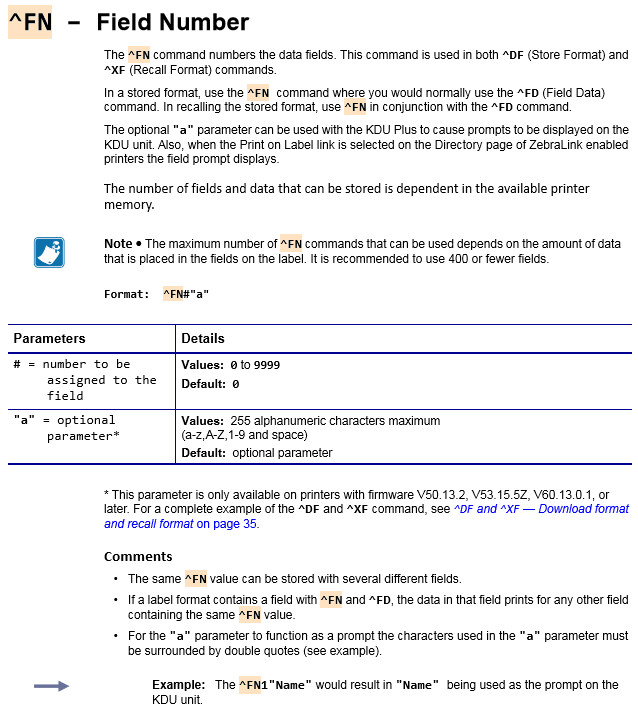 Zebra printers appear to treat the ^FN commands that reference alpha characters instead of numbers as the same field. ^FNSeq, ^FNXXX, ^FNTest may be assigned different values in the printer code. When the program passes the data to the printer via ^XS command (recall label format from printer memory) and defines the value of ^FNTest as “123456”, the fields marked as ^FNSeq, ^FNXXX and ^FNTest will all print the same value of “123456”. All ^FN definitions must use a numeric reference to operate correctly. All ^FN definitions using alpha / text characters must be changed to ^FN1, ^FN2, ^FN3, etc.